A bored dog is a destructive dog. Many people who would like a companion dog are reluctant to do so for the simple reason that a long day at work is not conducive to keeping a dog happy and healthy. Dog daycare provides the option to have a dog but ensure that it is active and having fun during the day, at the same time avoiding damage to your own house! Dog daycare will provide your dog with a sense of occupation so that when it goes home at the end of the day all it wants is to be with you and relax at home. Just like you. Daycare may seem like fun and games but it is an important addition to a dog's socialization. Your dog must be able to safely interact not only with people but also with other dogs. In today's litigious world it is a dog owner's responsibility to ensure their dog is a Good Canine Citizen. 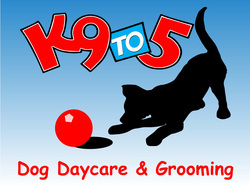 K9TO5 offers safe supervised play in an environment that allows dogs to be active and have fun, while maintaining their house manners. If you have a social butterfly and think they could benefit from some company during the day. Here at K9TO5, we do dog daycare a little differently. Having a smaller daycare allows us to really get to know your dog and give him/her the attention he/she deserves. Our daycare dogs are mainly small to medium breeds. When we accept a large breed dog, it's not because they're good, but because they're awesome! We don't separate the dogs here, so everyone must be able to share the toys, play nicely, and be respectful. Playtime is supervised and safe, and we are able to form a bond with your dog based on trust, friendship, and respect. Your dog's safety and well being is our top priority. If this sounds like your kind of dog daycare, give us a call or stop by. We would love to meet your four-legged friend!"